Film adaptations of video games are always a mixed bag. Sometimes you get absolute garbage like the Assassin’s Creed movie (praised by my 6th grade boys and absolutely no one else), and other times you get beloved garbage like the infamous Mario Bros. movie. For whatever reason most video games don’t adapt to the big screen very well, and for a long while I couldn’t place my finger on exactly what kept going wrong. After watching Tomb Raider, I finally have an answer. The Tomb Raider movie hits all the beats that one would expect out of a Lara Croft adventure. Lara is, as always, an agile and clever young woman with a knack for getting herself into dangerous situations and taking more of a beating than a punching bag at her local gym. The movie draws heavily from the 2013 and 2015 games, meaning that your primary antagonists are the Trinity organization and (to a much lesser extent in the film) Princess Himiko. There’s mysterious islands to travel to, dangerous traps that must be avoided, bad guys that are trying to shoot you, and of course a tomb that needs to be investigated. The movie manages to capture the frustration I felt playing the older Tomb Raider games quite well. Lara never gets a break at any point, and as mentioned earlier is a constant victim of physics and ill-tempered mercenaries. In the course of the movie she is hit by a cop car on her bike, washed down a raging river, hurled into the ocean in the midst of a storm, dropped off the side of a cliff, and impaled by a finger-sized wooden splinter, among other things. Those of us familiar with the punishing older games and vivid death scenes knew to expect this before the movie even started. 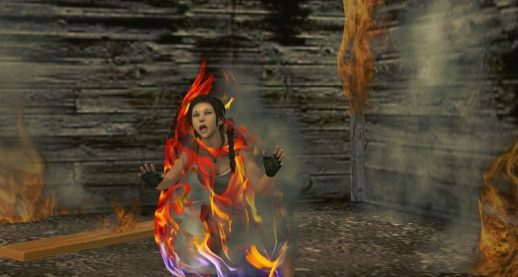 The Tomb Raider series is famous for the graphic deaths it will inflict on Lara if the player fails a puzzle or doesn’t heal fast enough. One might be impaled through the head by spikes, melted by lava, or even turned to solid gold in one iteration. You go into a Tomb Raider story expecting success to be rewarded by survival, and failure to be punished with increasingly graphic deaths as the series’ hardware advanced. Familiar puzzles were present as well: puzzle boxes to open her father’s research lab, a combo lock to open the tomb, color puzzles, trick floor tiles, all of it was there. Lara obviously couldn’t die in the movie, but the audience was still treated to several disposable goons ending up on the wrong side of the spike trap or losing their footing at the wrong moment. Even the way Lara moved around her areas felt reminiscent of the games. Lara participates as the lead in a bike race in the beginning of the movie, and the way it’s shot feels like watching a racing level. During her time in China, Lara grabs a pulley to swing herself around to the other side of the docks; on a boat later, she has to make her way across a gap by clinging to the ship’s damaged rebar frame like monkey bars, moves that I know were directly lifted from the most recent adaptations of the Tomb Raider series. The way she runs, ducks, dives, and especially climbs all felt like watching a video game character. As for the writing, it perfectly follows Tomb Raider structure. The majority of the dialogue is carried out while people are standing or sitting near each other in a small environment, a la cutscenes. 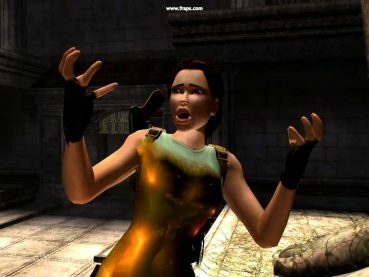 Between these you have action shots with almost no talking outside of screams from goons and agonized sounds caused by whatever malevolent force managed to wreck Lara’s day this time, representative of where the playable section of the game might be. Overall, Tomb Raider does everything it needs to do in order to be an excellent game in an established franchise. And that is precisely why it fails as a movie. Lara Croft is one of the most iconic female video game characters of all time, up there with Princess Peach and Zelda. Even if you haven’t played the games, you at least know the character by appearance and reputation. Yet the movie takes the first half hour to poorly establish who Lara Croft is and make sure you know we’re going with the most recent version of Croft family canon (wherein mother has been dead a very long time and father disappeared ages ago). There’s an unnecessary scene at the gym that only establishes we can expect Lara to take a beating throughout the film; characters she chats and works with vanish after the first act, never to be seen or heard from again. We forgive this kind of behavior in games because we can interact with the world around us; if we want to know all the details of Lara’s life, we can watch the scenes play out or skip the cutscenes entirely. But with the movie, you have to watch the trite build-up of a character whose personality is barely established (even within this half-hour) because it knows you know what to expect from Lara. The jumps, dodges, and even gunfights seem incredibly cheesy on screen. In a game you feel excitement at the sight of a brightly colored barrel because it’s a test of your skill (and just outright fun) to see how many goons you can explode at once by shooting it. But when it happens in the movie, you just roll your eyes. We make different allowances for suspension of reality in video games versus film. Exploding barrels only work in games because in the midst of a firefight without a checkpoint in sight, we’ll take just about any advantageous mechanic a game might offer us. In a movie? Not a chance. The violent abuse of Lara falls flat because there’s no risk to the player. We know that Lara is going to survive the parachute falling to pieces or being chased by armed mercenaries because the movie only has one path to take. I got a small snicker from Lara’s “Oh come on,” during one moment in the movie, but that was the absolute most reaction I had the whole time. There’s no chance that ducking behind this rock will result in a grenade blowing you to smithereens; there’s no button I can miss pressing and die via face-planting into a tree at mach 3. Likewise, this cheapens the puzzle scenes because Lara is destined to figure it out and survive. No unfortunate, low-dimension polygon woman might suffer a terrible fate due to incompetence on my part; success in every puzzle is guaranteed. And the deaths that we do see are rather unsettling. There is one scene in the movie where Lara is attacked by a lone mercenary. They wrestle for several minutes, until at last Lara drowns him in a shallow mud puddle. Let me be perfectly clear, Lara Croft has a pretty sizable body count across most games; those pistols traditionally strapped to her thighs are not for show. But the player can divorce themselves quite sufficiently from the violence because it’s painfully obvious that you’re watching a video game death, especially in the PS1 era games. In the Tomb Raider movie, you get the gruesome drowning right down to the death spasms and last bubble of air escaping up through the muddy water. It feels visceral and unsettling; perfectly run of the mill for a Tomb Raider story, and yet out-of-place, bordering on disturbing, for this movie. Audiences make different allowances for games than they do for movies, that’s obvious. But what people seem to forget is that many of those allowances are made because of our own personal investment in the characters and story of a game. Are we going to make a sandwich during Lara’s cutscene or find ourselves nodding along with her every word? Do we explore every nook and cranny of an area to find treasure and lore, or are we only here to complete the main story? We feel a rush of joy at completing a particularly tricky puzzle and have our stomach turn when a wrong move on our part causes Lara to perish with her spine bent at an unnatural angle, blank eyes looking towards heaven and silently asking “Why God, why?” (because some of us have lousy reflexes at 2 a.m. is why). Tomb Raider is about your experience going through ancient civilizations, infiltrating evil organizations, and making it out by the skin of your teeth. The movie puts that experience on rails and takes out your personal investment in the characters, leaving you at best with the sensation of having spent two hours watching a very pretty and high-condensed let’s play. They removed everything that makes the experience personal to you, without bolstering up the characters enough to make it their experience, meaning it’s a story for no one. Tomb Raider is still playing in theaters right now, and it’s not a bad way to spend two hours. Don’t go into this expecting the film that will establish the standard by which all video game adaptations should be judged; don’t even go into it expecting a great action movie. Just smile and nod knowingly at the moments you remember struggling through in the games, and be grateful that just this once it’s not your fault when something terrible happens to Lara.